Join the Poochy Doos Team in supporting Animal House Rescue by attending its 2nd Annual Choice City Comedy Nite: Sit! Stay! Speakeasy! fundraiser, April 13th from 6:30 – 10:00 at Lincoln Center, Canyon West Ballroom. 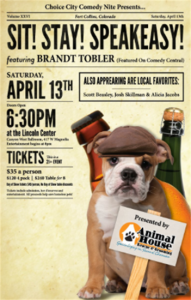 This fun event will feature national and local comedians, (including Brandt Tobler as seen on Comedy Central) jazz music, heavy appetizers, cash bar, giveaways, prizes, success stories from local adopters, and of course some adorable puppies! This is your opportunity to give back to Animal House Rescue who has given so much to our local community and the thousands of animals they’ve given a second chance at life. This is their biggest fundraiser of the year and will set the stage for their continued growth and success. Ticket prices are $35 in advance with discount pricing available for groups of four or ten. Prices include entry, appetizers, and hours of fun and laughter! See why people are still talking about last years event! One thing’s for sure, Animal House Rescue knows how to throw a big, fun party! Come out and join the Poochy for Choice Comedy Nite and let your hair down. There’s not many times laughter can actually help save a dog’s life! Need more info? Please see their website or give them a call: (970) 224-3647! Need pet sitting or dog walking for your Animal House Alum? Give us a call and support the local business that supports Animal House Rescue!